Volunteers clean up procession route for fallen officer Charles Irvine Jr.
Three south side residents wanted to pay their respects to fallen Milwaukee Police Officer Charles Irvine Jr. by cleaning up part of the procession route that officers will take after the funeral. Irvine died June 7 after a car crash near 76th and Silver Spring. Irvine and his partner were in pursuit of a reckless driver when their squad car flipped. His funeral will take place Saturday in Brookfield, before a procession will take Irvine's remains to the Forest Home Cemetery. On Friday evening, volunteers walked along Lincoln Avenue picking up trash, to clean up the last part of the procession route. Rafael Mercado is part of a group of volunteers called Team H.A.V.O.C, that do neighborhood cleanups almost every week. They usually focus on trying to find used needles , a common sight on the south side of town. "We were all talking and we're like what can we do for this officer," said Mercado. "The impact he already had on the north side was beautiful and we're like how can we pay tribute to him." Irvine is the first Milwaukee officer to die in the line of duty in 22 years. Neither Mercado or fellow volunteer Elizabeth Matta knew Irvine or his family, they just wanted to do their part to make the procession route look nice. "Every little thing equals a big difference," said Matta. "If cleaning this will help a little bit, I'm willing to do it." The public is invited to stand along the procession route to pay their respects to Irvine. His service will take place at 1 p.m. at Elmbrook Church in Brookfield. 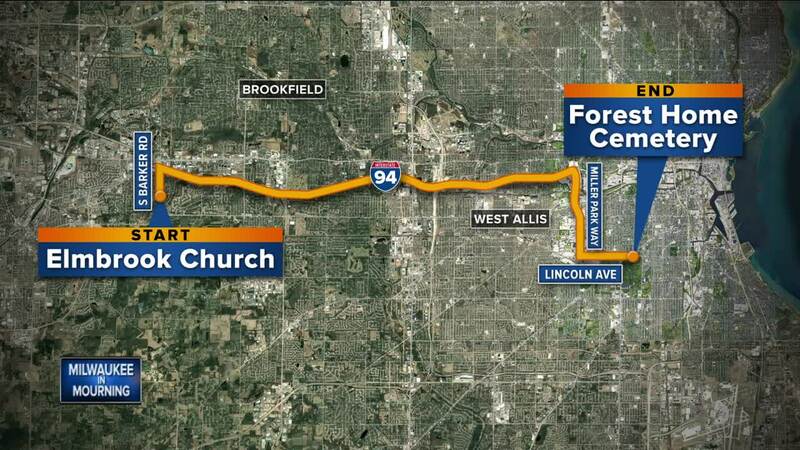 After the service, the procession will travel north on Barker Road, east on I-94 and then exit at Miller Park Way. From there it will head east on Lincoln Avenue, ending at Forest Home Cemetery where the family will have a private interment service.